Not a word usually associated with a Nintendo title. But those trying to recapture the magic of the original Yoshi's Island - one of the all-time greatest platforming titles - have butchered the job. Back in the 90s when Yoshi's Island was announced, it was billed as the follow up to another platforming classic - Super Mario World. We were disappointed, when we first heard that it was Yoshi and not Mario who was the main character in the sequel. That disappointment quickly faded as we finally got to playing the game and Super Mario World 2: Yoshi's Island still stands as one of the best platformers of all time decades later. Nintendo have attempted to recapture the magic several times. But updated remakes, spin-offs or a full sequel Yoshi's Island DS never came close to delivering the same sort of package. And the developers clearly have the same notion in mind. If Yoshi's New Island has got some good qualities, it's only due to the developers sticking as close to the original formula as they can. If you've played the first title, there are familiar elements. Challenges, story, and the mechanics are near identical. After a while it feels more like you're playing some sort of expansion rather than a separate game. Some things remain untouched: Yoshi can still swallow enemies, turn them into eggs he can then throw at other enemies, or use them to collect bonuses and extra lives. Baby Mario still needs protection, and each time an enemy hits you he starts to cry, jumps off Yoshi's back and a timer starts that indicates how long you've got to save him before he's lost. Bringing Mario safely to the end of the level is just one challenge though. There are also three kinds of bonuses that decide the level of reward you'll receive upon completion - and only the most dedicated players will unlock the bonus levels. There are five flowers in each level, and thanks to their size they are often the easiest to find. Stars can be acquired by vanquishing foes and finding bonuses, and collecting them increases your on-screen timer (to a maximum of 30 seconds), that counts down how long you've got to rescue Baby Mario when he's thrown off your back. 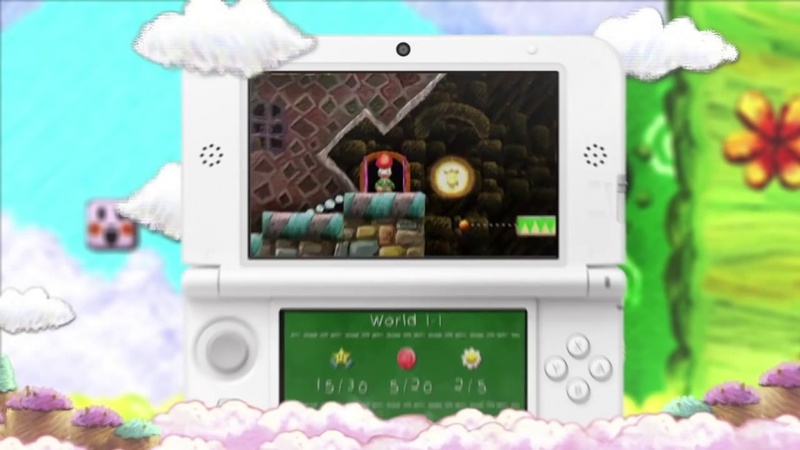 Finally there are 20 red coins hidden in each level, and these are often difficult to locate. As such they become the number one reason you find yourself replaying the levels over and over. They're also - partly - why this game manages to frustrate so much. But we'll get to that in a bit. Newer elements include gigantic enemies, many times larger than Yoshi, that you'll still be able to swallow, turn into eggs and lay waste to the environments with. These instances are limited to specific challenges, however, so it comes across as more of a gimmick than a part of the core design of the game. There is also a chance to collect Mario-inspired Stars that allows Yoshi to run across all surfaces and through enemies for a few seconds. You'll also be able to transform the gentle dinosaur into various vessels that are controlled via the gyro and act as bonus levels. Yet neither established mechanics nor the smattering of new additions are given enough space to shine. The level design is the worst the franchise has ever seen. It appears as if the whole design philosophy of the series, or even just basic platforming rules, has been thrown out for this game. Nintendo has an uncanny ability to create levels where the challenge seldom lies in locating the most tempting secrets, but rather in figuring out how to reach them. This simple philosophy is nowhere to be found here. You often experience instances where a certain enemy, who is only on screen for a couple of seconds, has that last red coin you're missing. If you can't catch the enemy in time, you have to replay the entire level in order to get it. The same goes for some of the bonus levels where you have to make a decision on route within a fraction of a second; the wrong choice means you need to restart the level. It's a lazy, boring and frustrating design decision, and it's very different from the well crafted game structure we're used to. A couple of co-op bonus levels are also included (if you've taken the time to find the extras in the single player campaign). Each of these bonus games are rather simple, and it's difficult to imagine anyone spending more than half an hour on any them. Usually they revolve around things like bursting balloons on time or turning enemies into eggs. It's ridiculously basic, and solely based on mechanics from the main campaign. It comes across as something tacked on just to make sure there was some sort of extra mode in there to put on the box. The same hurried approach also applies to the graphics. Yoshi's Island incorporated visuals stylised to look like children's drawings, a soft, warm palette that had immense charm. The Nintendo 64 game went with a more rendered look. It feels as if Yoshi's New Island lands somewhere in between, and the end result is messy. While the backdrops are often delightfully colourful, Yoshi and most of the other characters appear as if they'd been cut out of a cardboard box and whoever did the cutting the pay close attention to the lines. The result is flimsy outlines where nothing appears to fit together, and it's only when the games throws enemies taken straight out of the previous game that things pick up. However, many will likely to glad to learn that the all the action takes place on the top screen this time around. If this hadn't been built on the template of the original game, it'd be a complete disaster. The basic mechanics are still solid, and will satisfy the most die-hard platform fans for a while. There is, however no way around the fact that this is the sloppiest Nintendo adventure to date, and lacks its usual seal of quality. The solid gameplay foundation remains, Lots of secrets. Sloppy design, Messy visuals, Lacks that layer of Nintendo polish, Poor level design.